Pie Day? Who thought of this? And who would be crazy enough to drive 170 miles to check it out? Pie Day? Well, to answer the second question, I was. 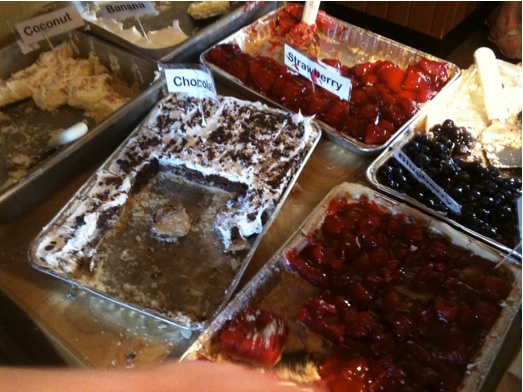 Clay’s Family Restaurant, a stone’s throw from the Michigan state line on former US27, just held its eighth annual Pie Day to celebrate what many agree they do best. Mind you, most all their food is worth celebrating, not just their scrumptious pies. But they make about thirty different kinds, and their customers find themselves in a quandary as to which one to choose–assuming they are capable after finishing their meals, which are tasty and generous. And so. . . Pie Day was born. I’ve written about Clay’s before. 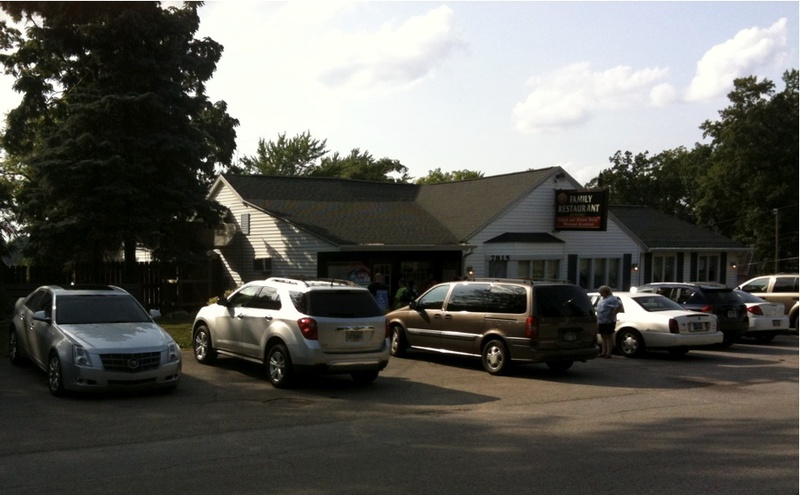 (Check them out here Clay’s Family Restaurant ) For sixty years this family-run restaurant, perched above Lake George not far from Pokagon State Park, has offered great food and friendly service to local folks and people passing through who prefer the old highways. When the restaurant opened, US27 was one of the major routes into Michigan, all the way up to the Straits of Mackinac. When I-69 opened decades ago, US27 was routed onto it, but business remains brisk at Clay’s, owing, no doubt, to its having laid such a solid foundation. Their entrees and especially the soups are fabulous, but the pies are positively divine. I learned of Pie Day last year and thought it might be fun to do. This is how it works: normally Clay’s is closed on Mondays, but in June there comes a Monday designated as Pie Day when, for just four mad hours, Clay’s is open. 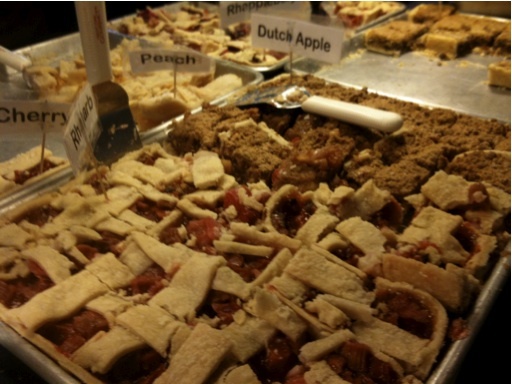 The restaurant sells advance tickets for a buffet offering of every pie they make–cut into smaller-than-normal pieces, of course, so one has a better chance of sampling several. Just so that it is not complete decadence, along with the plethora of pies, Clay’s serves soups and melt-in-your-mouth pot roast. Tickets, priced at $12.99 for all you care to eat, sell out quickly. Even if your capacity gives out before you sample all the pies, it’s a good deal. For about two weeks before the event, the owner and all the family frantically roll out pie dough in large square pans and refrigerate them, because the pies themselves are made fresh the morning of Pie Day, starting VERY early. 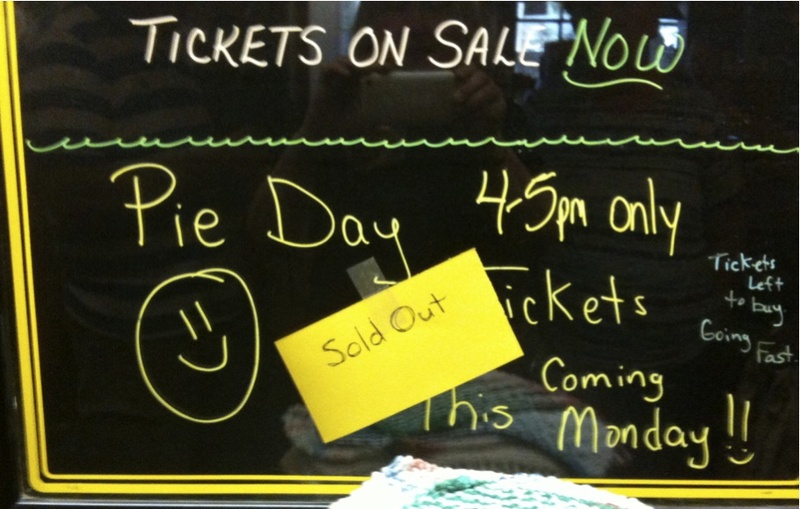 During the course of the four-hour event they sell the equivalent of 80-100 regular pies. And so, just for the experience, last month I called Clay’s and made the reservation. As it happens, I had a number of libraries to see on the way up since I’m still hawking my books, so it was not entirely crazy to make such a trip. (Well, okay, perhaps it was.) 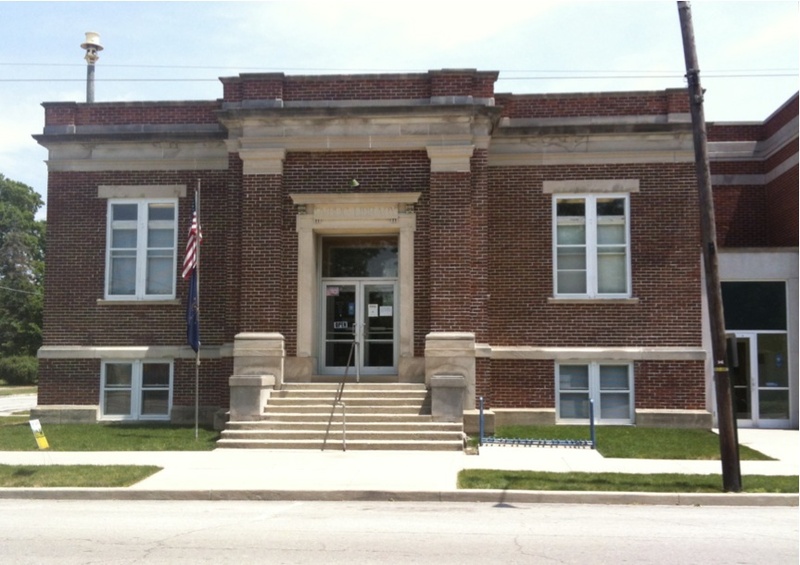 My route included stops, all successful, at two small college libraries and two little Carnegies, one in Converse and this one in Montpelier. On arrival at Clay’s around 6pm, the small parking area was full and there were only a few spaces across the street. The aroma of home cooking was tantalizing and soon we were seated by the harried but friendly waitress. Overindulging in the main dish fare would have been easy, but this was Pie Day, after all. Even so, there was no hope to taste them all. I think I managed to try about ten or twelve. 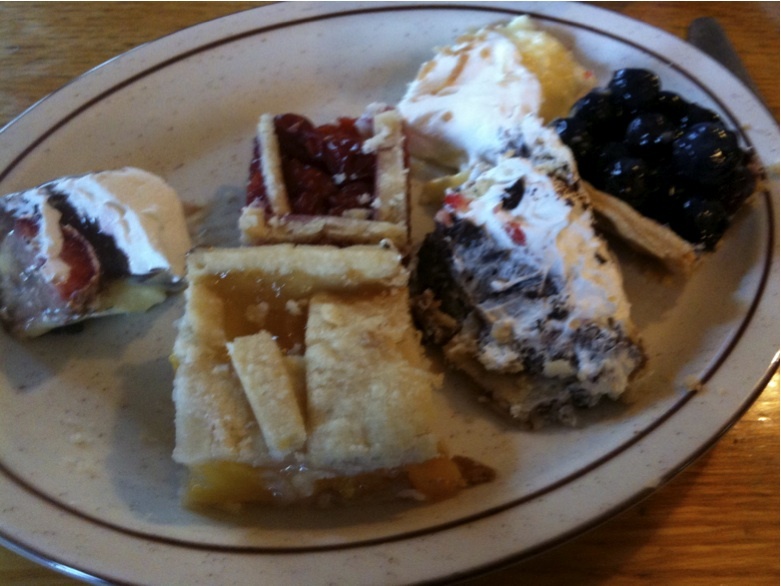 My vote still goes to the blueberry, which is the piece at top right, although the cherry is equally good. 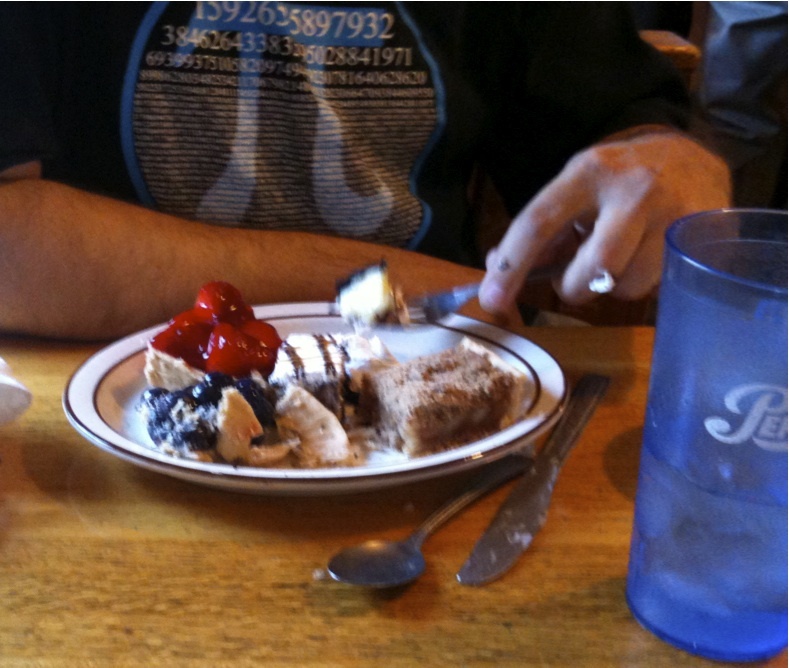 My companion, who wore an appropriate shirt (pi), favored the blueberry also, along with the strawberry. Virtually every fruit pie one can imagine, but also several cream pies, and a chewy concoction called “oops” pie tempted the customers. The atmosphere was festive, the staff resolutely friendly–indeed, everyone was smiling and laughing. I do not advocate gorging oneself on a regular basis, but indulgence now and then sweetens life, and Pie Day is the place to do it. This entry was posted in Following in My Foodstops, On the Road Less Taken... and tagged Clay's Family Restaurant, Indiana roads, nostalgia, road food. Bookmark the permalink. I tried that, and it was yummy. But then, all their pies are good, not a bad one in the bunch! Such a great little resaurant just north of Angola, Indiana! Terrific atmosphere next to Lake George! Very good food and terrific service. High recomendation from La Mesa, California!! !